There are 15 Assisted Living Facilities in the Kings Mountain area, with 3 in Kings Mountain and 12 nearby. The average cost of assisted living in Kings Mountain is $3,400 per month. This is higher than the national median of $3,346. Cheaper nearby regions include Gastonia with an average starting cost of $2,946. To help you with your search, browse the 77 reviews below for assisted living facilities in Kings Mountain. On average, consumers rate assisted living in Kings Mountain 4.5 out of 5 stars. Better rated regions include Arden with an average rating of 5.0 out of 5 stars. Caring.com has helped thousands of families find high-quality senior care. To speak with one of our Family Advisors about assisted living options and costs in Kings Mountain, call (855) 863-8283. Kings Mountain is a small city in the Charlotte metropolitan area. Originally called White Plains, Kings Mountain changed its name in 1874 because it was the closest town to the Battle of Kings Mountain in York County. In 2014, Kings Mountain was listed as the fifth best place to retire in North Carolina, according to the real estate company Movoto. Seniors interested in this area will find three assisted living residences (ALRs) in Kings Mountain and 12 nearby. All are regulated by the North Carolina Division of Health Services. There are two types of ALRs in the states: adult care homes (ACHs) and multi-unit assisted housing. The climate in Kings Mountain is hot and muggy in the summer and cold and wet in the summer. The area gets about 46 inches of rain each year, 4 inches of snow and approximately 216 sunny days. The summer high is around 89 degrees, while winter lows in January drop below freezing. Kings Mountain has a crime rate that is 57.5 percent higher than other U.S. cities. Violent crime was below the national average, while property crime was more than the national average. Kings Mountain is an inexpensive place to live, which is great for seniors on a budget. The cost of living is 16 percent lower than the national average. The Kings Mountain area is home to world-class medical facilities, including the Carolinas HealthCare System, in the event of medical emergencies or illness. Kings Mountain has an array of community resources for seniors, including the Aging Program Advisory Board, an organization that works to promote and provide programs for senior adults through the Patrick Senior Center, as well as two senior centers. Multiple agencies are available within Kings Mountain to provide transportation for seniors, including Carolina Transportation Care. Assisted Living costs in Kings Mountain start around $3,400 per month on average, while the nationwide average cost of assisted living is $4,000 per month, according to the latest figures from Genworth’s Cost of Care Survey. It’s important to note that assisted living rates in Kings Mountain and the surrounding suburbs can vary widely based on factors such as location, the level of care needed, apartment size and the types of amenities offered at each community. 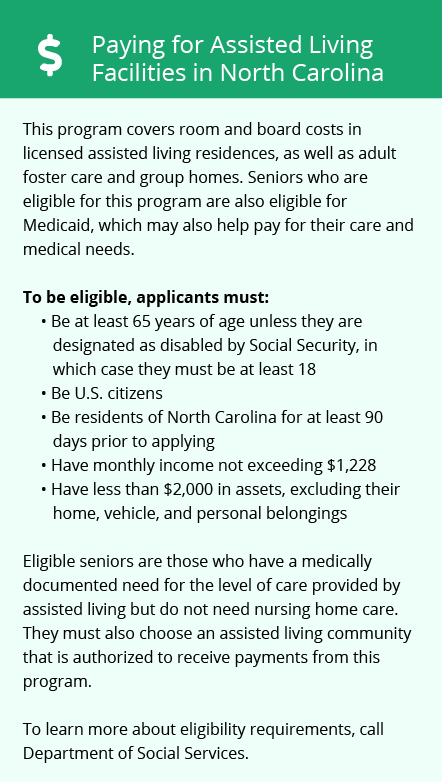 Part of the cost of an ACH in North Carolina qualifies for assistance under the Medicaid State Plan. The criteria for eligibility is based on the federal Supplemental Security income payment and other additional forms of income. 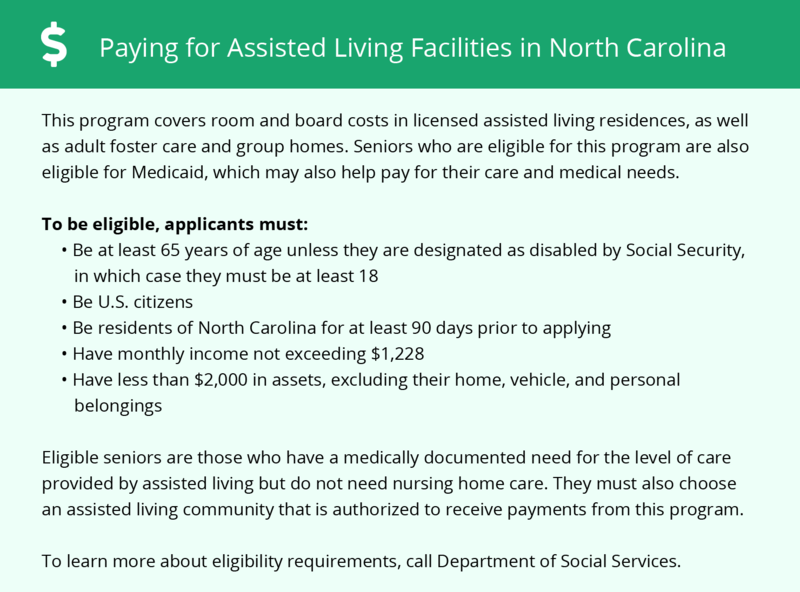 The State of North Carolina Special Assistance Program provides financial assistance to pay for the cost of an ALR. Adult foster care home and group homes. This program is designed specifically to help with rent and board. Kings Mountain and the surrounding area are home to numerous government agencies and non-profit organizations offering help for seniors searching for or currently residing in an assisted living community. These organizations can also provide assistance in a number of other eldercare services such as geriatric care management, elder law advice, estate planning, finding home care and health and wellness programs. To see a list of free assisted living resources in Kings Mountain, please visit our Assisted Living in North Carolina page. Kings Mountain-area assisted living communities must adhere to the comprehensive set of state laws and regulations that all assisted living communities in North Carolina are required to follow. Visit our Assisted Living in North Carolina page for more information about these laws.